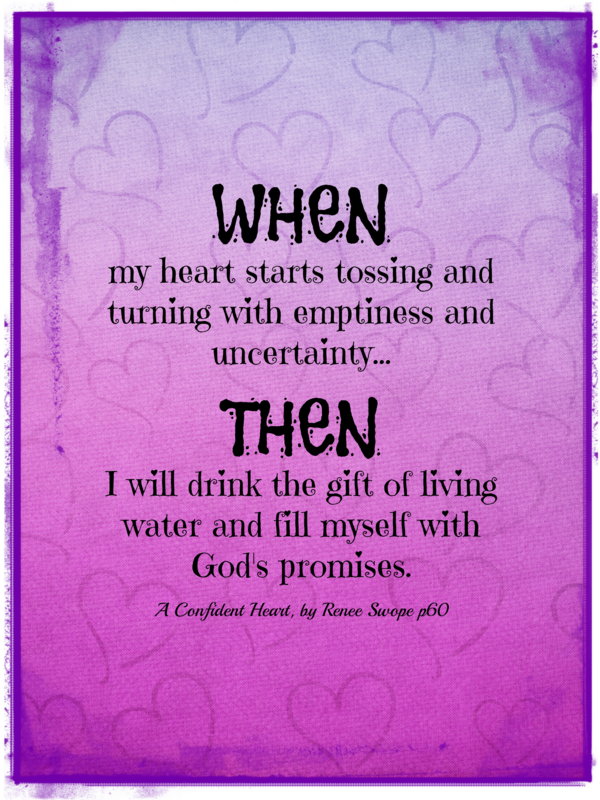 Many words in Chapter 3 of Renee Swope’s A Confident Heart stood out to me. I set out to highlight Scripture and underline phrases that I have either felt or thought myself…not much of the chapter was left untouched! I realized that a lot of it spoke of a time in my life years ago when doubt took a deep seat in my life; however, much of it also highlighted truths about the past year of my life. Confused. Distracted. Incomplete. Value. Significance. Insecurity. Validation. Accomplishments. Longing. Acceptance. Approval. Worth. Performance. Status. Acknowledgement. Recognition. After immigrating to the U.S. on a fiancé VISA almost a year ago to marry my incredible husband, I was then launched into a period of waiting. First I had to wait for employment authorization, then for a job, then for the green card…it seemed never-ending; I felt lost and confused. I allowed myself to become overwhelmed with the process instead of looking to the One who was in control of it. Did you know that when you come to the U.S. on a fiancé VISA, in the period before you receive your green card, you are classed as an ‘alien’? At times, I felt like one. I felt like I didn’t belong. I had left the U.K., but I wasn’t a ‘resident’ in the U.S. yet. I would need permission to leave the U.S. and re-enter…called ‘extended parole’! So the U.S. hadn’t decided if they wanted me yet, and I couldn’t go back to the U.K. without permission. Who was I? I began to focus on the ‘alien’ term and turned to the Lord. He told me that in a way we are all aliens! WHEN I feel like I don’t belong in this country, or world, THEN, I remember that I am not of this world, and that Jesus is preparing a place for me in heaven, my eternal home. I am no longer a stranger or alien, but a citizen of heaven (John 15:19; John 14:2; 2 Corinthians 5:1; Ephesians 2:19; Philippians 3:20). In this search and longing to belong, I was then over-joyed when I received my employment authorization. Finally, I could get a job. That would mean I could be a proper American living and working in the U.S. I saw this as an opportunity for a fresh start, to reinvent myself, and even find a new career field. I longed to find a job where I could be of value, receive approval as being successful, and mean I had ‘made it’. Of course, I measured all of this by society’s standards. If I could just have the status, the title…receive the “well done” from those who know me, THEN I would belong and be accepted by America. I even remember having the same conversation as Renee had (ACH, p53) with my own mother, asking her if she would still love me, if she would be disappointed in me if I couldn’t find a ‘good’ job. I didn’t want to fail my parents and let them down. Success…I did it. I got the job. I was even allowed input in creating my title, and the fact that we put ‘Manager’ in it meant I was someone that was of worth, I was important. It only took a few months for me to discover that the job I found myself in was not what the Lord created me for…I was unhappy and stressed…like I had lost my identity instead of finding it. I was then presented with a new problem: quitting would mean failure. I was trapped in my desire to succeed and my fear of failure. I felt the Lord speak greatly to me during the last Proverbs 31 online study – What Happens When Women Say Yes to God, by Lysa TerKeurst. I listened as He instructed me to be confident and say “Yes” to Him and walk away from this job. He confirmed again and again, even giving me the day on which to do it. Despite my fears of appearing to the world as a failure, I had to be obedient in this step and reaffirm my identity in Him, not society. WHEN I begin to seek my identity in a job or status, THEN, I remember that my true identity is in Christ. I belong to a chosen people, a holy nation, and God has called me out of darkness to walk in the Lord Jesus Christ (Colossians 2:6; 1 Peter 2:9). Through all of this, I also longed to establish myself as a ‘perfect wife’. HA! I basically set myself up for failure! I am a sinner…how is it possible to do ANYTHING perfectly! I fail EVERY DAY! Thankfully, I am married to a wonderful man who does not base our love on performance and longs to love me as Christ does…unconditionally. Despite this, I still struggle with not being the wonderful wife who can cook all, mend all, make all, clean all…of course, all while looking perfect and smiling! WHEN I begin to fear the future and what is going to happen in my life, THEN, I will remember that the Lord knows the plans that He has for me, and He has commanded me to be strong and courageous. He will be with me and where He leads He will also give me the words and wisdom to face any opponents, speaking through me by His Spirit (Proverbs 29:11; Joshua 1:9; Luke 21:15; Matthew 10:20). I will go where He leads with #AConfidentHeart and the Lord’s #priceless #perfectlove in my heart, and WHEN I feel like God doesn’t see or care what is going on in my life, THEN, I will remember that He knows the number of hairs on my head. He created me in my mother’s womb and He ordained the days of my life before I was even born (Luke 12:7; Psalm 139:13-16). Thank you for sharing – you have some very thought provoking messages and “When-Then” statements. This is very encouraging and we all need that every day. I am sure the Lord has great plans for you and your husband. Continue to love and respect each other as Christ would and things will go smoother than you may think. It won’t always be easy – but worth the Godly love you share. Great blog! I could relate to it so well–especially the work and wife perfection issues. Your writing is so easy to read–you should not hide this talent–you should let it shine more and more! Sarah, Your When/ Then Statements rang true for me as well. Thanks you for Sharing your story. WHEN I begin to seek my identity in a job or status, THEN, I remember that my true identity is in Christ. I belong to a chosen people, a holy nation, and God has called me out of darkness to walk in the Lord Jesus Christ (Colossians 2:6; 1 Peter 2:9). Yes…this one is a certain for the ‘No Fail-Pail’! What an honor to read of your journey thus far, Sarah. Our Lord has wonderful plans for you! Love your story, beautiful words and awesome when then statements. Thank you for Sharing! Wonderful when-then statements! Love it!